By Agus in Mobile. Updated on October 14, 2017 . Can you take a guess at how many photos are taken every day? It doesn’t matter what device it is taken on, a camera, smartphone or a tablet. We’re not sure either, but judging from the figures you can see in this post, it’s in the billions, every single day. Hence, we’re sure you’re going to need a photo management app as much as you need storage to keep all those photos of food, children, pets, plane window shots you are taking daily. The apps shown here are available for mobile, which we’re guessing is the most popular way we’re taking photos now. Some of them have great ways to better sort and organize your photos for you; others have handy sharing capabilities and album-making "powers". Do check them out and let us know of other photo management apps that you know of. Always struggling to keep all your photos and videos but lack the space to do so? Crunch is an app that can help reduce the size of your favorite photos and videos so you can store more, and delete fewer of your precious memories. This also makes it less taxing on your data plan. Crunch makes your photos smaller by up to 6 times, without compromising on the quality of said photos. Videos can be reduced to about 50% of their original size as well. 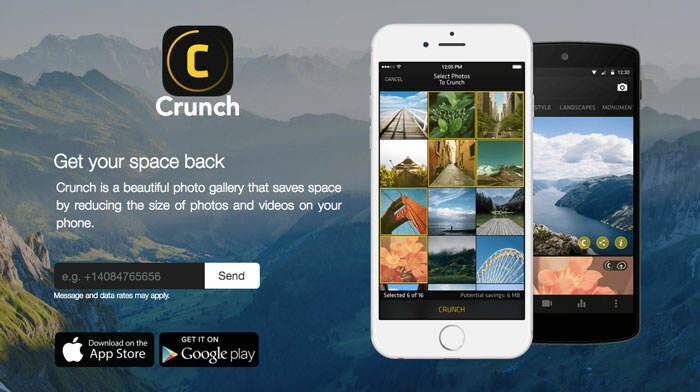 Crunch reduces the file sizes with the use of proprietary photos and video technologies. The app offers up to 1 GB of free space, which is extensible by sharing about the app. 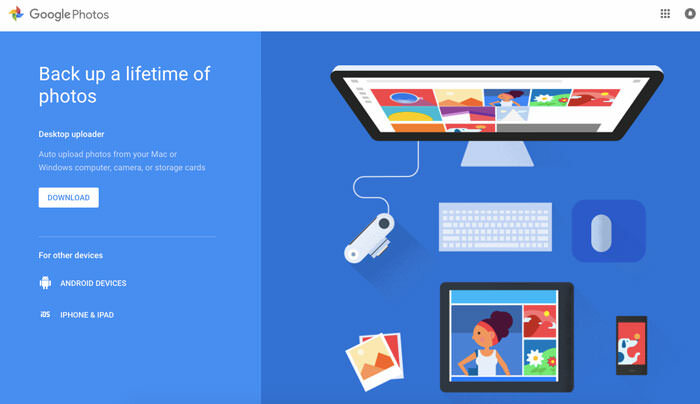 A smarter home for your photos and videos, Google Photos offers automatic backup, organization system, and a powerful search engine to better sort and find your photos. It gives users free unlimited storage for backing up unlimited high-quality photos and videos. You can access your photos from any devices you have or via the website. With this application, you can also create movies, collages, animation, and panoramas from your photos instantly. On top of that, your photos can be edited simply and powerful by photos and videos editing tools which are used to apply filters, adjust lighting, and many more. 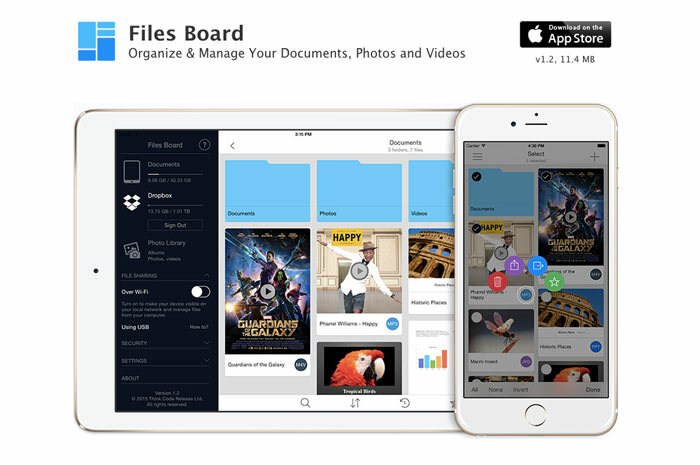 FilesBoard is an app for iOS which comes in an interface much like Pinterest and makes it easy to manage your photos and videos. Not only that, it’s also a manager for your documents, music, bookmarks, and more. You can also opt to manage your files wirelessly over WiFi, from your desktop. Not only can you manage and organize your files, folders and albums in your device gallery, you can also do the same for your Dropbox folder. Filesboard lets you change the color of your folder, create text files, change creation data and time, add notes to specific files, and import images and videos from external sources. You can also apply password protection on the app to safeguard your documents and photos. This is an intelligent gallery that learns what is important to you. My Roll allows you to arrange and connect your photos for a more organized and meaningful look at the best moments in your life. Best of all, it can highlight the best shots from your gallery for you. The app is so smart, it could center a thumbnail around smiling faces and if you give it access to your calendar, it can title photos around specific events that occur around the same time the photo was taken. 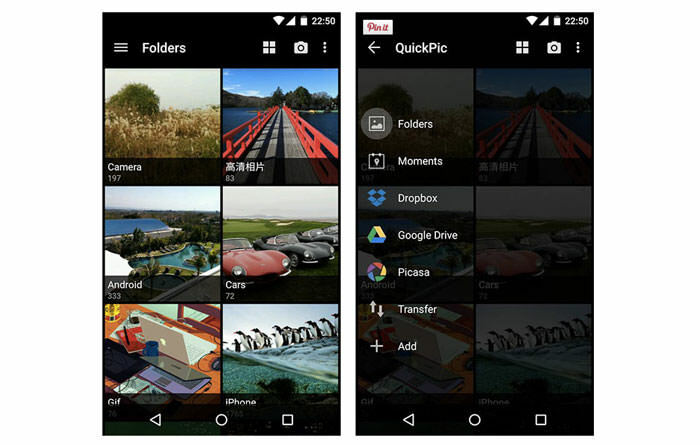 MyRoll comes with 50GB storage and can integrate with Google Photos for more unlimited storage. MyRoll is also available for Android Wear. 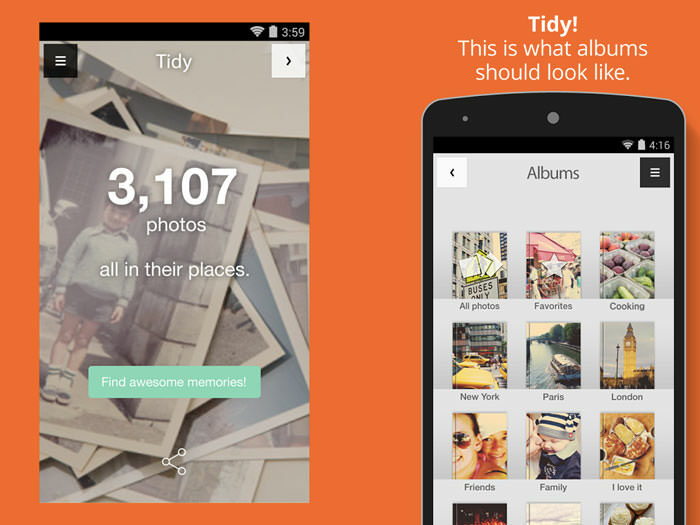 Tidy helps you to organize your photos with just one swipe. The makers claim that it can clean up thousands of photos in minutes (you will need to have thousands of photos to check if this is true). To use it just swipe right to keep them in a new album or left to store them away in archives. Put your photos in their rightful places. Photos are grouped by time, place and even shapes. Once you’ve cleared up the chaos, Tidy will find memories for you and display them in a nice layout and beautifully arranged albums. The end result is also easily shareable on your favorite social media sites. This is one of the alternative album applications which can replace the stock gallery application. QuickPic supports online cloud storage services such as Google Drive, Dropbox, Flickr, One Drive, Box, Xandex, 500x, and many more. You can find new pictures instantly via the filters: time and location. Quickpic will make a slideshow view of your photos for you to scan or edit with their internal photo editor. Using its powerful management features, you can sort, rename, create new folders, move and copy pictures easily. Photos and videos you want to keep for your eyes only can be protected by password. Once you are done, you can transfer your media files between multiple devicies via WiFi. You can get the APK files here. After attending an event such as a party, you’d probably have to spend a while clearing up the photos you’ve taken. You will find duplicates, blurry photos or photos that didn’t turn out the way you want (and are beyond saving). You can clear all these things up quickly and easily with Slidebox. 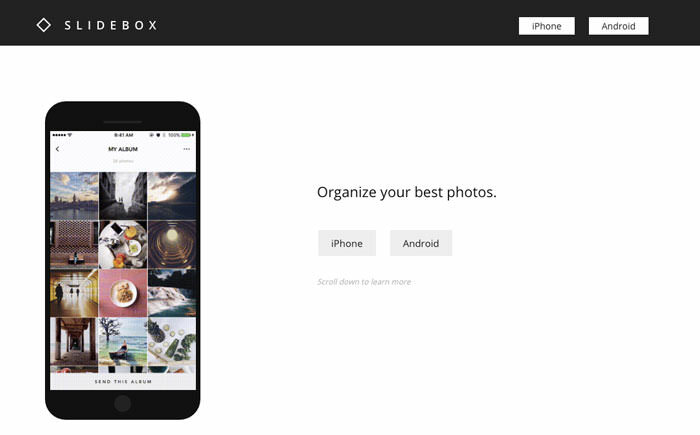 Slidebox lets you organize photos and album directly in your photo gallery. Swipe away photos you want to delete and sort the best ones into a separate album. Compare photos side-by-side to find duplicates and decide which version stays and which ones go. Moments is a great app that helps you sync photos with friends, making it the app to have if you have a lot of gatherings, parties and group activities. Moments recognizes your face from your profile picture and the pictures you are tagged in on Facebook. 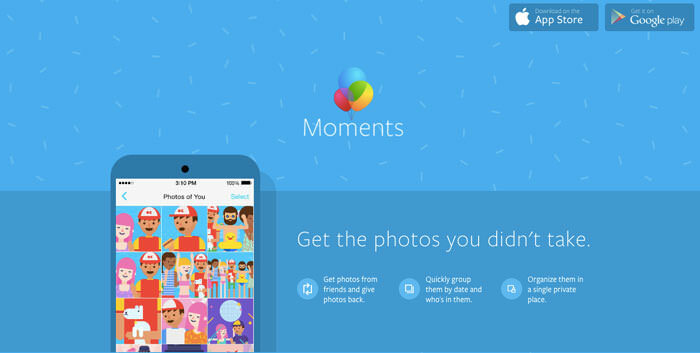 You can then swap your photos with your friends’ photos via Moments. This app will help you to sort the photos based who you took the photo with, and when it was taken. No more email attachments or manually picking photos to send to multiple friends. Picjoy makes it fun and easy to create and share stories of your pictures while keeping everything private and personal. Simply install Picjoy application and let the organization begin quickly. 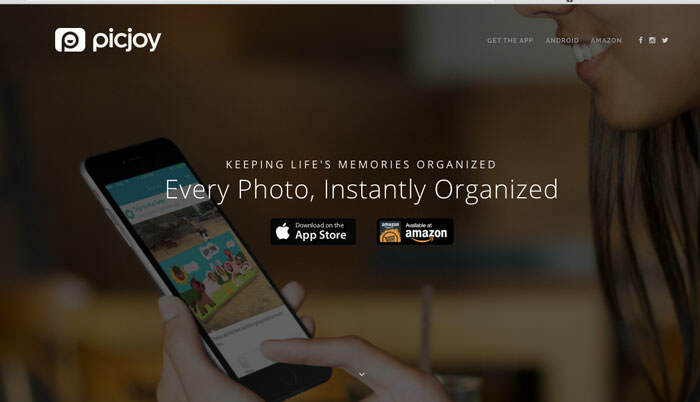 It is an intelligent photo library that automatically organize all photo while still allowing you to create beautiful photo albums and tell the story behind your photo experience. You can also search your photos by location, weather, season, event, time, and many more categories.